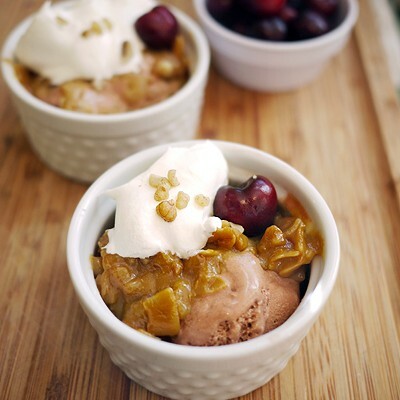 When summer rolls around, there is one dessert I really crave — ice cream. 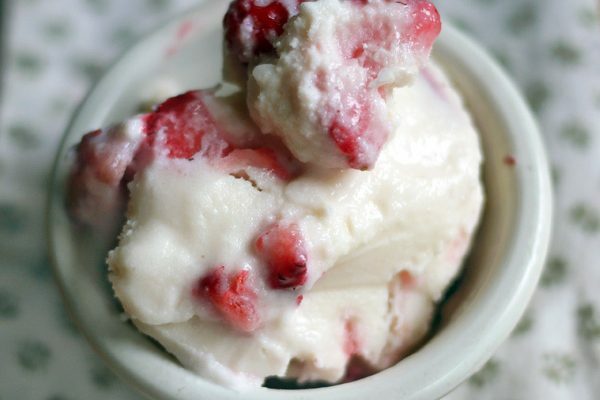 I love to make ice cream in all it forms: ice milk, frozen yogurt, sorbet, granita, etc. 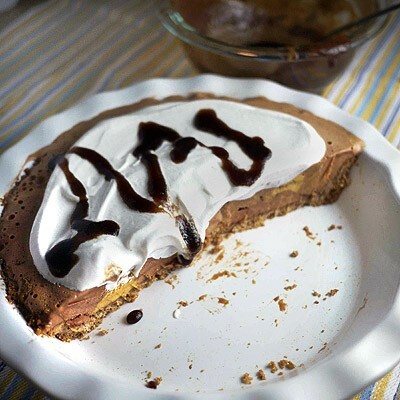 And when I need a dessert to please a group, ice cream pie is one of the easiest ways to turn this iconic summer treat into a dessert for all. This ice cream pie recipe features a homemade crust and homemade whipped topping, sandwiching one of Dreyer’s & Edy’s new summer Slow Churned flavors: Caramel Coconut Cookie Ice Cream. And homemade pie crust is actually pretty easy. To make the crust, just blend together graham crackers, coconut flakes, coconut oil and butter (see full recipe below). Instead of coconut flakes, use powdered caramel creamer or coffee mix, finely chopped ginger or any citrus zest. Use chocolate sauce or fresh fruit instead of caramel. I don’t know about you, but I can think of a different ice cream pie I can make each week of summer! It’s definitely going to be a good one at my house. PLACE graham crackers, coconut and sugar in food processor or blender; cover. Honey grahams are shown above. Process for 30 seconds or until mixture resembles fine crumbs. Place crumbs in medium bowl; stir in melted coconut oil and butter. Stir until crumbs are moistened. Press crumbs evenly onto bottom and up side of 9-inch glass pie plate. BAKE for 20 to 22 minutes or until crust is set. Cool crust completely on a wire rack. SPREAD softened ice cream into pie crust. Cover; freeze for 6 hours or until ice cream is completely firm, as shown above. PLACE cream and sugar in chilled medium mixing bowl. Beat just until stiff peaks form. Evenly spread whipped cream over ice cream. Sprinkle with toasted coconut; drizzle with caramel topping (above shows chocolate sauce). Cut into slices; serve immediately. This ice cream pie recipe features a homemade crust and homemade whipped topping, sandwiching one of Dreyer's & Edy's new summer Slow Churned flavors: Caramel Coconut Cookie Ice Cream. And homemade pie crust is actually pretty easy. To make the crust, just blend together graham crackers, coconut flakes, coconut oil and butter. PLACE graham crackers, coconut and sugar in food processor or blender; cover. Process for 30 seconds or until mixture resembles fine crumbs. Place crumbs in medium bowl; stir in melted coconut oil and butter. Stir until crumbs are moistened. Press crumbs evenly onto bottom and up side of 9-inch glass pie plate. SPREAD softened ice cream into pie crust. Cover; freeze for 6 hours or until ice cream is completely firm. PLACE cream and sugar in chilled medium mixing bowl. Beat just until stiff peaks form. Evenly spread whipped cream over ice cream. 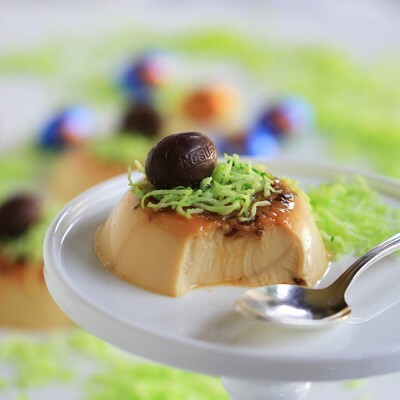 Sprinkle with toasted coconut; drizzle with caramel topping. Cut into slices; serve immediately. Helping in the Nestlé Kitchens gets me big benefits: lots of recipes that need tasting plus I get to watch Chris cook (her tips are even better live!) and what better month than February, a chocoholic’s dreama chocoholic’s dream. After tasting Chris’ Make-Ahead Chocolate Soufflés and hearing how easy it was, I decided to attempt my very first soufflé. And, I had just the Valentine to impress; this would be our first Feb 14 together. I used a recipe for two servings (omitting the Treasure). The ingredient list was short, the instructions looked easy and watching Chris’ video below made me feel really confident. I love to cook – but I don’t bake a lot – so halfway through I realized I didn’t have a mixer! I had to beat the egg whites by hand; they didn’t form stiff peaks so I was afraid the soufflés wouldn’t rise. With only a few minutes to spare, I pulled them from the oven and ran to meet my date. The next day, I made it for my girlfriends and doubled the recipe. It was so easy I did it from memory! Buttermilk is beloved in recipes for its ability to make rich, moist cakes and this Rich Chocolate Buttermilk Layer Cake is one of my favorite cake recipes ever. It’s easier to make a layer cake than I ever thought, and it’s really impressive — great to make for friends’ birthdays! It’s also a perfect way to use up all your family’s leftover Halloween candy. The possibilities are endless! And don’t forget to get my delectable peanut butter frosting recipe here! Cake recipe from Meals.com. 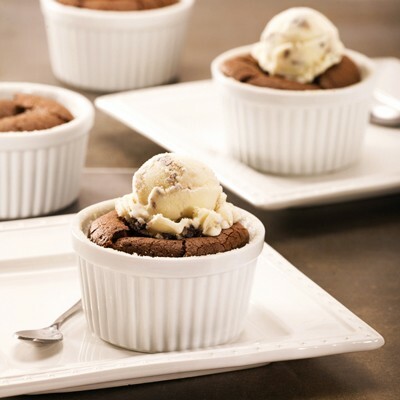 PREHEAT oven to 350° F. Grease bottoms of three 8- or 9-inch-round cake pans; line with a parchment or wax paper circle. Grease parchment, then coat lightly with small amount of cocoa, tapping out excess. SIFT flour, ¾ cup cocoa, baking soda and salt together into a large bowl. Combine buttermilk, coffee and vanilla extract in small bowl. BEAT butter in large mixer bowl until smooth. Beat in sugar until smooth and creamy. Beat in eggs one at a time, beating well after each addition. Scrape down sides of bowl with rubber spatula; beat again. Alternately add flour mixture in three additions with the buttermilk mixture in two additions, beginning and ending with flour mixture. Scrape down sides of bowl; beat again. Pour batter evenly into prepared pans. BAKE for 20 to 25 minutes or until wooden pick inserted in center comes out clean. Cool in pans on wire racks for 10 minutes. Invert each layer onto wire rack; remove parchment paper, then invert right-side-up. Cool completely. TO ASSEMBLE: Level (trim tops off) the cakes if desired using a serrated knife. Place a dollop of frosting in the center of a cake pedestal or serving platter so the cake won’t slip. Tear four strips of parchment paper and place in a square around the outer 3 inches of pedestal (this will help prevent getting the frosting on the pedestal). Place one cake layer over dollop of frosting. Spread about 1 cup frosting over top; sprinkle top evenly with about a quarter of the chopped candy bar. Top with another cake layer; spread with about 1 cup frosting. Sprinkle with another quarter of the chopped candy bar. Top with third cake layer. Cover the top and sides with a thin layer of frosting (this is the “crumb coat”; it doesn’t have to be perfect). Refrigerate for 15 minutes, then cover with the remaining frosting. With hands, press remaining chopped candy around sides of cake. After the frosting has set, gently remove strips of parchment paper. Cut cake into slices for serving. Buttermilk is beloved in recipes for its ability to make rich, moist cakes and this Chocolate Buttermilk Layer Cake is one of my favorite cake recipes ever. TO ASSEMBLE: Level (trim tops off) the cakes if desired using a serrated knife. Place a dollop of frosting in the center of a cake pedestal or serving platter so the cake won’t slip. Tear four strips of parchment paper and place in a square around the outer 3 inches of pedestal (this will help prevent getting the frosting on the pedestal). Place one cake layer over dollop of frosting. Spread about 1 cup frosting over top; sprinkle top evenly with about a quarter of the chopped candy bar. Top with another cake layer; spread with about 1 cup frosting. Sprinkle with another quarter of the chopped candy bar. Top with third cake layer. Cover the top and sides with a thin layer of frosting (this is the "crumb coat"; it doesn't have to be perfect). Refrigerate for 15 minutes, then cover with the remaining frosting. With hands, press remaining chopped candy around sides of cake. After the frosting has set, gently remove strips of parchment paper. Cut cake into slices for serving. If you’ve ever made a chocolate cake, or even a chocolate triple-layer cake, without adding peanut butter frosting (or filling between the layers), you haven’t lived. Much like the famous candy that marries chocolate and peanut butter so well, this frosting pairs just as exceptionally with chocolate cake. So here you go…and you’re welcome. Chocolate layer cake recipe up next….stay tuned! In medium mixer bowl, beat heavy cream and granulated sugar on medium-high speed until stiff peaks form; set aside. In large mixer bowl, beat cream cheese, peanut butter and powdered sugar on medium speed until smooth and creamy. Reduce mixer speed to low and add the whipped cream, beating until just blended. 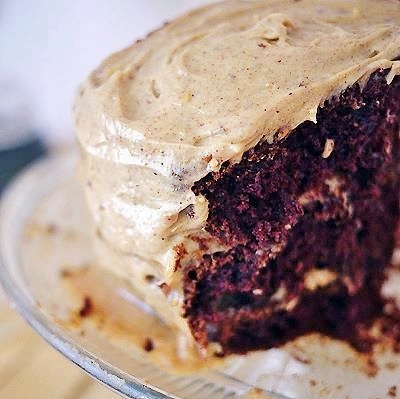 Just as the famous chocolate/peanut butter candy professes, this peanut butter frosting was meant for chocolate cake. My dad’s favorite cake has always been German chocolate cake. 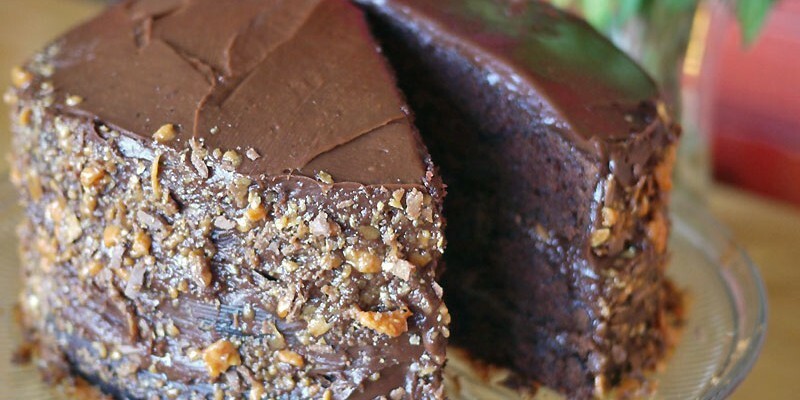 Early in this cake’s life, that meant using Samuel German’s baking chocolate to make a light-bodied chocolate layer cake, then adding coconut, caramel and pecan icing or glaze in between the layers and on top. You can see why he liked it so much! When I was young, this was not my favorite cake to eat (no nuts or coconut for this girl, thank you) and it wasn’t the easiest cake to make either. My dad sometimes received a leaning tower of cake mess, other times a whole new version of the cake without layers or coconut or nuts after misreading the salt measurement — I accidentally switched the salt and sugar amounts — and dumping the entire first attempt into the creek behind our house. And for this, he should be thankful. Today, I join my dad in loving German chocolate cake. And even though I now know how to make chocolate layer cakes, I really love to make these German Chocolate Cake Ice Cream Sundaes instead. It’s easy and satisfying and I don’t even have to turn on my oven! The ice cream even has little bites of chocolate cake in it (and if you can’t find the special German Chocolate Cake summertime flavor, any chocolate ice cream with brownie chunks will do). The flavor takes me right back to countless Father’s Days and birthdays for my dad, which I can now make taste richer and creamier. COMBINE evaporated milk, sugar, egg yolk and butter in a large saucepan. Cook over low heat, stirring constantly, for about 5 minutes or until thickened, as shown above. Remove from heat; stir in vanilla extract, pecans and coconut. Pour into a bowl; cool to room temperature. PLACE scoop of ice cream into each of 6 bowls; drizzle with topping. Garnish with whipped cream and cherries, if desired as shown above. Serve immediately. My dad's favorite cake has always been German chocolate cake. Today, I join my dad in loving German chocolate cake. And even though I now know how to make chocolate layer cakes, I really love to make these German Chocolate Cake Ice Cream Sundaes instead. It's easy and satisfying and I don't even have to turn on my oven! COMBINE evaporated milk, sugar, egg yolk and butter in a large saucepan. Cook over low heat, stirring constantly, for about 5 minutes or until thickened. Remove from heat; stir in vanilla extract, pecans and coconut. Pour into a bowl; cool to room temperature. PLACE scoop of ice cream into each of 6 bowls; drizzle with topping. Garnish with whipped cream and cherries, if desired. Serve immediately.